Pain and Understanding – Thanks Morgan for 16.5 great years! For years now, we have joked and talked about my old dog Morgan. 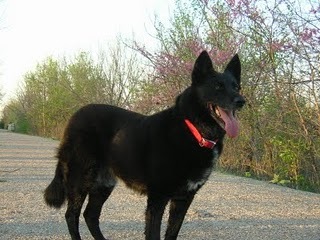 The energizer bunny of the canine world; this shaggy black Shepard/Collie mix has been through it all. In her 16.5 years she’s had both front legs broken, fought in tons of scraps and battles, then even got run over by me in my own driveway a year and a half ago. Today was just like any other day for Morgan – she was in her favorite cool spot on the garage floor, she stumbled to get a drink, stumbled back and pretty much was just chillin. Little did she know that I had already planned for “her time” to come before Memorial Day Weekend. Sure the past week had it’s extra struggles for her, but not much more than any other… so how did I know it was time? I had prepared myself and I had prayed and today around noon, I felt at peace enough to load her up one last time and take her to town…. I was choking myself up in the hour or so before I left. I felt like it was somehow unfair for me to decide the moment that was right… I was hoping it would happen naturally before now, so I could avoid the responsibility of it… I knew that her fate was up to me and I was just praying that I was making the right choice for her. Morgan is old. Really old for her breed. She’s in terrible health. She is in obvious daily pain. This choice for me to let her go is actually easy when you look at it like that… It’s the right thing to do. What about God’s choice to let people go? 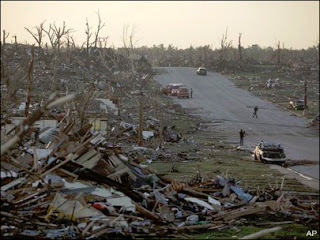 This week started out with a vicious tornado ripping through Joplin, Missouri. It took the lives of at least 122 people. Sure the houses and things are gone. The replaceable things. But the people and families that will never see each other… well, that is pain that stays with us forever. How hard do you think it hurts God to know that somehow, someway, in terms that are Impossible for us to understand, he’s done the right thing? So just like me today, when I was holding Morgan’s head and petting her coarse black fur for the last time, I do think that God knows the right thing to do. I have not always thought that. Plenty of people I know have experienced my sadness, rage and terror in these tragic moments. I may not always be able to understand from now forward either… But, in this moment, when I had my tiny version of playing God, I did. I do know that if we let him, he’ll lovingly hold us and care for us in these painful times of loss and transition. 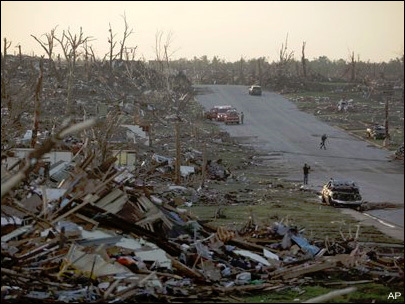 I feel that God’s Grace and presence has been shown this week with the absolute outpouring of support, love, donations and assistance to the Joplin area. If you have loved ones down there, then prayers are continuing for you and your family. This human loving connection is now showing it’s amazing abilities, and awesome it is. Old TV & Old Financial Advice = Which one has Snazzier Pants? Jack Tripper taught me a valuable financial lesson this week! My TV watching here in Princeton, Kansas is limited to what comes in for free on my antenna. Usually I get to choose from the main networks, a couple local re-run channels and of course my favorite PBS!! Anyway, just this week I noticed that Antenna TV is now showing up on 4-2 and it has old TV shows from my youth, Yahtzee!! 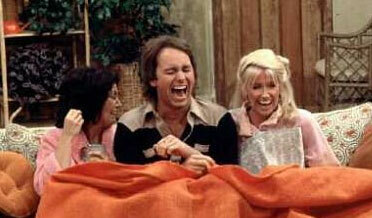 I think it was Tuesday when I got sucked into a classic episode of Three’s Company. The gimmick for this show’s hijinks and shenanigans was a brand new to 1981(ish) term called “Computer Dating”. Anyway, the point here is that watching this show now, and hearing them discuss “Computer Dating” and showing a manilla-colored card that must’ve been some kind of printout, was awkward and funny. There are some things in our world that don’t cycle and change and seem ridiculous in retrospect. hmm… so if they’ve been saying the same thing for a couple thousand years and it still rings true today? Well then, I’ll take that as proof of true wisdom! I can tell you from the perspective of someone who has come out of the land of debt and now live free of it, I couldn’t agree more about this concept. When we owe, Off to work we must go. Without debt in our lives, we open up a world of options to ourselves. Start your journey out of slavery and into freedom today. It is worth every step you will take. I promise! You’re chances of looking foolish (like Jack Tripper) on this journey are high. Most of our society is still listening to the marketing and recommendations of lenders and people that want to sell you “the good life” for 90 days same as cash, or 0% interest or a store credit card with lots of discounts and “incentives” attached. I’ll take the Real Good Life, and continue to be debt-free, thanks anyways. If you want to shut down the TV, pick up a book and get some old-school wisdom, let me know. I’ll be glad to point you in the right direction! Book It! I really wish I would get a personal pan pizza for every book I read this summer… You think the Pizza Hut crew will notice that I’m over the age of 6? Back in December I wrote about reading. Since then; reading I’ve been. Burning (through) books is an awesome way to change your future for the better! 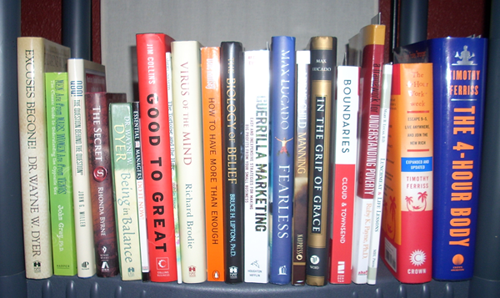 Here is an update/quick review of the titles I’ve enjoyed over the last 5 months – I would love to loan you a copy if you are interested. Otherwise, get online and buy you some books! Seth gets it, then gives to you straight. He is THE marketing authority. Tribes are it. I wouldn’t trade my True North Blog Readers Tribe, Camp CarpCo or RumRunners tribe for anything! Proves his point that we are built to connect with others and move toward a common goal. I love that. What an awesome job Brian has done in creating an optimal life for himself and others. Reading this book is fun, easy and dynamite powerful. The best of the great philosophers, served up as inspirational appetizers. Bravo Brian! I remember ideas poppin’ late into the night after reading Purple Cow. Absolutely the truth about what inspires us and gets our attention in this distraction-zone called life. Be unique or be overlooked. Emphasize your differences, and wave your “You” flag proudly! Like a thirsty man needs a cold pitcher of ice water, I needed this book. Explaining that we all deserve Grace and it’s ours if we ask for it, I was lighter in the heart after letting the ideas in this book resonate. Thanks be to God! I love it when people who don’t have to; share their success secrets with me. Mr. Beaudine has truly found the essence of our human connectedness and its importance. A Must read! The actions we fear, the moments that scare us: they’re the ONLY ones in which we grow and gain… Very cool book. I was/am inspired to continue to be a Lion Chaser. Thanks Mark! This is my first Bible that I’ve bought as an adult. 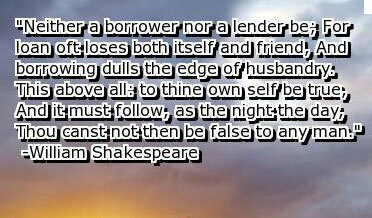 I have really enjoyed having it around and referencing it often. I was new to the idea of a Study Bible, and I’m glad Pastor Tim recommended it. It really fills out the scripture and makes the Word easy to enjoy! Very inspiring, fun read and covers the gamut of ‘perception change’ as a way to deal with life’s problems… Would Recommend to everyone. I read it in 3 days I think? Good One. This is the most practical book for learning techniques to step up and deal with tough situations between the important people in your life. The STATE Principal is worth the price of the book. I think the mastery of the tools they discuss can take anyone, anywhere in life, they want to go: because, it takes People to make that happen. Dealing with people is the one skill we can all use every day! Okay, I really-really wish I would have read this one a few years ago. MUST-READ for anyone to wants to break out of the Rat Race. Chapter after chapter is like Ding, Ding, Ding, Duh!! A new paradigm in understanding serious wealth and how to create it, is explained in simple words and pictures. Even after my whole journey out of debt, jump to self-employment and total immersion in self-discovery… My mind was blown by this book! 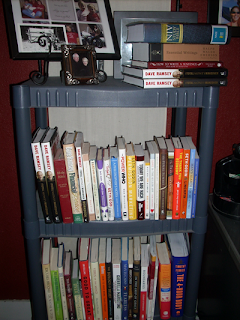 My December post shined a light on the power of reading, but I left out an important idea. 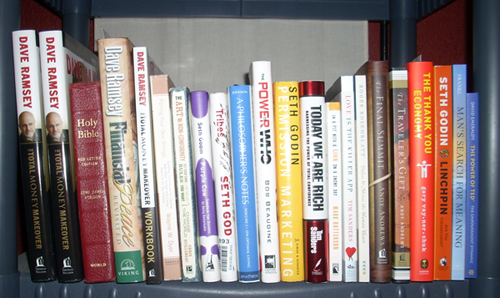 I was speaking about Non-Fiction and instructional/inspirational reads… What we are putting into our minds is what we will become. So… choose your reading carefully. Just because it’s in a book doesn’t mean it’s good for your brain! Growing Things is on my mind! I was blessed this afternoon to have my Grandparents… and I mean “Grand” in the fullest sense of the word, give my backyard garden some Love today! We planted peppers, tomatoes & cucumbers, yum! Bill and Carol Smell are my Mom’s parents. They’ve been lovingly tending the “garden of me” since before I was born… For all their love and hard work, I’ve grown wild and unruly at times. Hopefully, lately, I am becoming more of the plant they can be proud of! Anyway, I love ’em like crazy. I’m also proud that they read this blog every week! Did you know that what you focus your mind on Grows? That is right. It is a Universal Law. is where your future is. Is your mind on your debt? Do you think about the “lack of money” to do the things you want to do? Your debt, Your lack… it’s growing! Your “what you do have”, your “awesome potential” and your “plenty”… is growing! Make sure you’re growing something that you want more of… And if you’re not? This is really true, really powerful; works in every area of life and really is something that I work on every day. Till next week, I’ll be thinking powerful thoughts for you!